I always seem to forget how many awards are awarded each autumn! I’m especially slow on the uptake this year… Beyond lots of translating, there’s been lots of book and bookshelf moving around here, though I have to admit that moving books is an oddly pleasant distraction, at least in small doses. This year’s Yasnaya Polyana “XXI Century” award went to Arsen Titov for Тень Бехистунга (Behistun’s Shadow? The Shadow of Behistun? ), a big, old-fashioned historical novel, apparently a trilogy, set during World War I. The “Childhood, Adolescence, Youth” award went to Roman Senchin for Чего вы хотите? (I’ll go with Whaddya Want? ), which sounds like a very personal book—one of the three pieces is written from his daughter’s perspective—about growing up in contemporary Russia. The “Contemporary Classic” award went to Boris Yekimov for his 1999 long story/novella Pinochet. For more (in Russian) on this year’s winners: Lenta, ReadRate, and Prosto biblioblog. Happy birthday (new style) to Andrei Bely! The Andrei Bely Prize winners pique my interest more than this year’s Yasnaya Polyana winners. Two poets won this year. The poet I’m familiar with is Kirill Medvedev, who was recognized for Поход на мэрию, which I’ll call Attack on City Hall since that’s what the title poem is called in It’s No Good (Всё плохо), a book translated by the team of Keith Gessen, Mark Krotov, Cory Merrill, and Bela Shayevich. I wrote a bit about It’s No Good in this 2013 post; I’ve read more chunks of the book since then and enjoyed them, too. This year’s other poetry winner is Irina Shostakovskaya, for 2013-2014: the last year book. The 2014 Bely Prize prose winner is Aleksei Tsvetkov, for Король утопленников (King of the Drowned). This book features prose texts arranged by size: the first takes up less than half a page, the last is around 80 pages long. Though the ordering of the stories seems gimmicky, the book looks rather appealing. King of the Drowned has already made the long list for the NOS(E) award; it was not written by the poet named Aleksei Tsvetkov. The Bely site includes names of winners in other award categories, including humanitarian research, translation, and criticism. The Bely shortlist is also available here; I somehow missed it when it was announced in September. The only shortlisted book I’ve read is a prose finalist: Serhij Zhadan’s absorbing Voroshilovgrad, which I read in Zaven Babloyan’s translation from the original Ukrainian. Up Next: Books galore… Evgeny Vodolazkin’s first novel, Solovyov and Larionov, Marina Stepnova’s Italian Lessons, and Viktor Remizov’s Ashes and Dust. Plus a small pile of books I’ve been reading in English. Andrei Platonov. I visited Andrei Platonov’s grave at the Armenian Cemetery on my first full day in Moscow: I wasn’t quite sure where to find Platonov and had to ask several people before a helpful security guard and his friend (who’d never heard of Platonov and grilled me about what to read) led me to Platonov’s grave. I would certainly have found it without the guard: two people were celebrating Platonov’s life, graveside, with vodka and a book. There’s something a bit odd about Platonov’s gravestone: at certain times, depending on the sun’s angle, the soft sign at the end of the word писатель (writer) seems to disappear. I noticed it was missing as we stood, talking, and everyone assured me it existed… and it did reappear a while later. Platonov turned up again, in the form of a book of his letters, published in 2013 by Elena Shubina’s imprint at AST: writer Vladimir Sharov very kindly gave me his extra copy and it’s a nice, heavy book with lots of photos, footnotes, and a lengthy introduction by Natalya Kornienko. For more: EricNaiman’s review in The Times LiterarySupplement complements positive comments I heard from a writer friend. The Congress of Literary Translators. The main reason I went to Moscow was the Congress of Literary Translators, hosted by the Institute of [Literary] Translation at the Library of Foreign Literature. Each attendee presents a brief paper within a small “section”: with over 200 attendees from 55 countries, there were nine simultaneous sections. That might sound like a madhouse but everything seems to work itself out. Scheduling conflicts meant I missed a few talks I wanted to hear, but each section I attended magically worked out to a manageable size that allowed dialogue. I’ve come to appreciate the short presentations, too: at first it felt difficult to come up with something meaningful and brief but I now think of the mini-papers as executive summaries or micro-length case studies of current work… My paper addressed usage and translation of old language in contemporary fiction, drawing on my work on Marina Stepnova’s The Women of Lazarus, Vladislav Otroshenko’s Addendum to a Photo Album, and Evgenii Vodolazkin’s Laurus. I spoke most about Laurus since I could offer a method for my handling of old Russian words: I have a raft of reference materials but find it particularly useful to compare Bible translations (the Elizabeth and Tyndale translations) on the STEP Bible site from Tyndale House at the University of Cambridge. One of the high points of my Kongress was the chance to speak with Vodolazkin about Laurus—particularly that old language—and my translation. During a joint evening session with Valerii Popov, Vodolazkin, who’s a scholar of Russian medieval literature at Pushkin House, mentioned that he had to get away from the philological before he could write the book: he didn’t want to write a professory book. And he didn’t which is why, I think, his medieval setting and occasional archaisms work so well, so organically… As for other papers, I particularly enjoyed Christine Mestre’s talk about translating dialogue in Elizaveta Aleksandrova-Zorina’s The Little Man: Christine mentioned topics including mistakes in characters’ speech and handling details on what people do as they speak. The Little Man is one of the books I brought home so I’ll be watching for those elements. A few other papers of interest: Margherita Crepax on enriching language through translation; Oliver Ready on his translation of Vladimir Sharov’s Before & During, which I’d just read; and Kristina Rotkirch on Margarita Khemlin. Disclaimers & Disclosures: The usual. I work on occasional projects for the Institute of Translation, which subsidized many of my travel expenses, and Read Russia. 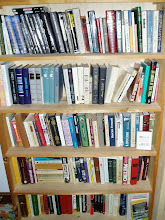 Many of the books in the photo were gifts. Thank you! Up Next. Yasnaya Polyana Award winners on Tuesday. Then books galore… After something of a summer slump, I’ve been having a great reading run, starting with Evgeny Vodolazkin’s first novel, Solovyov and Larionov, and followed by Marina Stepnova’s latest book, Italian Lessons and Viktor Remizov’s Ashes and Dust. There’s also a bunch of books I’ve been reading in English. I’m glad to have lots of books waiting for posts: after Ashes and Dust, my next Russian-language book will likely be Zakhar Prilepin’s rather long (okay, very long) The Cloister, which has relatively small print, too, meaning it will take some time. Image Credit. Platonov’s grave photo by Andranikpasha, through Wikipedia Commons. Happy Birthday to the Bookshelf! Another October 16, another cupcake! The blog turns seven on this blustery day and the feelings I mentioned two years ago—using the words “gratifying” and “humbling”— seem to have doubled or tripled or quadrupled. I send very heartfelt thanks to all of you who visit, whether regularly or occasionally, and find my posts useful. I’m glad you enjoy them! As always, there’s something a little new and different this year. For one thing, the bookshelf itself, which has grown into a fairly large installation of several bookcases, is moving. Upstairs. Into the living room and out of the mudroom. The reason for the move has nothing to do with a more prestigious or spacious location for the books and everything to do with a weird domino effect… the first block was toppled, of course, by a junior cat who gnaws on shoe leather and laces. The other new and different is that I’m translating even more this year, working now on Evgeny Vodolazkin’s Laurus, with Vadim Levental’s Masha Regina waiting for me. Two other books—Vladislav Otroshenko’s Addendum to a Photo Album and Marina Stepnova’s The Women of Lazarus—are in various stages of editing. It’s an understatement to say the words “gratifying” and “humbling” apply here, too. I love my books and I love my work. Geography. The United States still leads in sheer visitor sessions, followed by United Kingdom, Russia, Ukraine, and Canada. In terms of how much people read, though, among the top ten visiting countries, visitors in Italy read more pages per session (1.92), followed by those in the Netherlands (1.9), and then the UK and Canada (1.72). In terms of cities, the top five were New York, London, Kyiv, Moscow, and Kerrville, Texas. Hmm. Popular Posts. As far as landing pages go, the most popular, other than the home page, is Russian Fiction for Non-Native Readers, followed by Top 10 Fiction Hits of Russian Literature. These were both in the top three last year, too. After those posts come pieces about “The Overcoat,” The Belkin Tales, and The Petty Demon, favorites all, though last year’s most popular classic, A Hero of Our Time, didn’t make the top 10 posts this year. It was kept away by posts with a list of new translations for 2014, two Kuprin stories, Laurus, and two of Gogol’s Petersburg stories. Needless to say, I’m particularly glad Laurus attracts attention—it’s a wonderful book and my most visited contemporary fiction post—and I’m very grateful people use the translation list. That reminds me to remind translators and publishers: please send information about what’s coming in 2015. I’m gathering listings! Common and Odd Search Terms. Well, there aren’t many these days: the most common terms are typically dull things about finding Russian literature. Since many searches don’t reveal terms these days, even the top number is low, 25 for lizok’s bookshelf. The top search for a specific book is, interestingly enough, freedom factory kseniya buksha, which I haven’t even read, followed by sanctuary 3/9. Other contemporary terms in the top 20 are vodolazkin (two variations), sergei samsonov/ russian writer, and “marina stepnova.” Only two classics are in the top 20: the petty demon summary and a hero of our time summary. Hmm, summaries. Even looking through lots of terms, I don’t find much unintentional humor these days, just straightforward requests for analysis, summaries, themes, and titles though the search for are there any fight scenes in war and peace is a bit peculiar. I’ll stop there, with the reference to War and Peace, since it is, still, my all-time favorite. Thank you again for your visits, your comments, and your notes. I look forward to meeting more of you over the next year, whether virtually or in real life! Up Next: My has a lot piled up during the time I’ve been wearing myself out with a persistent, tickly, dry Moscow cough! Moscow trip report. Yasnaya Polyana Award winners. Then books galore… After something of a summer slump, I’ve had a great run, starting with Evgeny Vodolazkin’s first novel, Solovyov and Larionov, and Marina Stepnova’s latest book, Безбожный переулок, which is, wisely, being called Italian Lessons for English-language purposes. And now Viktor Remizov’s Воля вольная, which has, also wisely, been renamed for English-language purposes: Ashes and Dust. There’s also a bunch of books I’ve been reading in English. I’m glad to have lots of books waiting for posts: after Ashes and Dust, my next Russian-language book will be Zakhar Prilepin’s rather long (okay, very long) Обитель (The Cloister), which has relatively small print, too, meaning it will take some time. Here you go, Russian Booker fans… the 2014 short list, in Russian alphabetical order. Winners will be announced on December 5. The Russian Booker will award two prizes again this year: one to a “usual” winner, the other in the form of a grant to publish an English-language translation in the UK. Anatolii Vishnevskii’s Жизнеописание Петра Степановича К. (The Story of the Life/Biography of Petr Stepanovich K.). The description of this book, which is evidently completely based on documents, is a little vague: it’s apparently about a man who lives a long life but wanted glory more than longevity, though longevity gives him a chance to see a lot. Natalya Gromova’s Ключ. Последняя Москва (The Key. The Last/Final Moscow). This one’s called an archival novel, and it apparently focuses largely on the 1930s and a Moscow that no longer exists. Gromova works at the Tsvetaeva house museum in Moscow. There’s more here. The Key is already a 2014 Big Book finalist. Elena Skul’skaia’s Мраморный лебедь (The Marble Swan). According to Novaya gazeta, this is memoiristic writing about friends and family. Even a quick look at the text on the Zhurnal’nyi zal site shows that it’s made up of vignettes/tiny chapters. Vladimir Sharov’s Возвращение в Египет (Return to Egypt). In which one Kolya Gogol (a distant relative of familiar old Nikolai Gogol) finishes writing Dead Souls. An epistolary novel. Already a finalist for this year’s National Bestseller and Big Book awards. One of the most interesting things about this year’s Booker short list, at least for me, is that four of the six books—Gromova, Prilepin, Remizov, and Sharov—are or will soon be (re)published by editor Elena Shubina’s imprint at AST. And what can I say but that Shubina is a force? And I just seem to gravitate to her books: she published two of the books I’m translating (Marina Stepnova’s The Women of Lazarus and Evgeny Vodolazkin’s Laurus) and now I’m reading Stepnova’s new book and about to read Remizov’s (coming soon from Shubina/AST) and Prilepin’s. I’m also looking forward to reading the tome of Andrei Platonov’s letters she published last winter… more about that one in my Moscow trip report this weekend. Up next: Moscow trip report. Then, at last, books! Evgeny Vodolazkin’s first novel, Solovyov and Larionov, which I enjoyed very, very much (footnotes have never been so much fun), and Marina Stepnova’s latest book, named for Moscow’s Bezbozhnyi Lane. Plus a few books I’ve read in English. I’m more than a little slow with this year’s NOS(E) Award long list, which came out nearly two weeks ago (! )…I’m still dragging a bit thanks to the never-ending cough I brought back from Moscow but, even worse in terms of speed, I was curious enough about some of these books to want to look them all up. Though many of the titles and writers were familiar from previous reading as well as other long- and shortlists, others were completely unknown to me. You can read any of the books on the long list and/or vote for a book on the NOS(E) site, here. NOS(E) will announce its shortlist on Halloween. Here’s the list, in Russian alphabetical order. Valerii Aizenberg’s Квартирант (Tenant). According to critic Nikolai Alexandrov, Tenant is a monologue from someone looking to rent out an apartment, addressed to the prospective tenant. Aizenberg is also an artist and the book includes his art. Svetlana Aleksievich’s Время сэконд хэнд (See Second-Hand Time for a detailed description and a list of translations). Nonfiction about Russia’s post-Soviet history. Iurii Arabov’s Столкновение с бабочкой (Clash/Collision with a Butterfly). Hmm, chapter one is titled “Ленин в Цюрихе” (“Lenin in Zurich”); in an interview Arabov referred to the novel as alternative, “what if,” history. Iurii Buida’s Яд и мёд (Poison and Honey). The only book on the list I’ve already read, if only in part. I bought the book in Moscow and plan to read the stories, too. Linor Goralik’s Это называется так (This Is What It’s Called or some similar combination of words…). Short stories and a play. Maksim Gureev’s Покоритель орнамента (Conqueror of Ornamentation? The title phrase is in the text but…). A mixture of the here-and-now and historical times… apparently involving a rug at a Crimean museum. Aleksei Makushinsky’s Пароход в Аргентину (Steamship to Argentina). A novel about émigré life and Proustian searches. A 2014 Big Book Award finalist. Makushinsky, BTW, is Anatolii Rybakov’s son. Anna Matveeva’s Девять девяностых (Nine from the Nineties). Short stories. Some, including (apparently) this one, were written for Snob. Margarita Meklina’s Вместе со всеми (Along With Everyone) Short stories. Iurii Miloslavskiii’s Приглашённая. Материалы к биографии Александры Федоровны Чумаковой (excerpt) (Invited. Materials Regarding the Biography of Alexandra Fedorovna Chumakova). About the Big Stuff: love, time, identity, rebirth, and death. Indescribable-sounding. Aleksandr Mil’shtein’s Параллельная акция (A Parallel Action). A “novel-palimpsest,” according to this review. Elena Minkina-Taicher’s Эффект Ребиндера (The Rehbinder Effect). Evidently a family saga. The effect in the title is described, stubbily, on Wikipedia here. Aleksei Nikitin’s Victory Park (excerpt). I bought this novel in Moscow and am looking forward to reading it: it’s set in Kiev’s Victory Park area in the late 1980s. Short listed for the 2014 Russian Prize, novel category. Vladimir Rafeenko’s Демон Декарта (Descartes’s Demon). About a man who’s reborn multiple times, wandering the world and wanting to choose one life/fate for himself. Vladimir Sorokin’s Теллурия (Tellurium). On my NatsBest long list post, I wrote: A polyphonic novel in 50 highly varying chapters. Also shortlisted for this year’s National Bestseller and Big Book awards. Tatyana Tolstaya’s Легкие миры (Light Worlds? In which light has the meaning of not heavy…) Short stories; the title story won the Belkin Award. I bought the book after hearing Tolstaya speak at the Moscow International Book Fair in early September. Tatyana Freidensson’s Дети Третьего рейха (Children of the Third Reich). Nonfiction written by a journalist. Aleksei Tsvetkov’s Король утопленников (King of the Drowned). Prose texts arranged by size… the first takes up less than a half a page, the last is around 80 pages long. NB: This book was not written by the poet named Aleksei Tsvetkov. This book currently leads NOS(E) reader voting. Vladimir Sharov’s Возвращение в Египет (Return to Egypt). In which one Kolya Gogol (a distant relative of familiar, beloved old Nikolai Gogol) finishes writing Dead Souls. An epistolary novel. Finalist for the 2014 National Bestseller and Big Book awards. Oleg Yur’ev’s Диптих «Неизвестное письмо…» (Diptych. “An Unknown Letter…”) The letter is to Fyodor Dostoevsky, from one Ivan Pryzhov. Up Next: Moscow trip report. Then books: Evgeny Vodolazkin’s first novel, Solovyov and Larionov, and Marina Stepnova’s latest book, named for Moscow’s Bezbozhnyi Lane. Click here to sign up for a free subscription through a feed reader. For disclaimer/disclosure information, please visit this page. Unfortunately, I cannot send a personal answer to each and every message I receive, though I do read all messages and try to respond. Please do not send messages to me at more than one address. Please note, too, that I do not offer personal advice or custom book searches (please check sites like Amazon, WorldCat, or Goodreads for books, including the existence of translations), and I do not have a favorite author! Gogol's "Nose" and "Nevsky Prospect"
V. Terras's "Handbook of Russian Literature"
D.S. Mirsky's "A History of Russian Literature"